Photo Credit: Ocean Power Delivery Ltd. The Pelamis Wave Energy Converter is a semi-submerged structure composed of cylindrical sections linked by hinged joints. The wave-induced motion of these joints is resisted by hydraulic rams, which pump high-pressure fluid through hydraulic motors via smoothing accumulators. 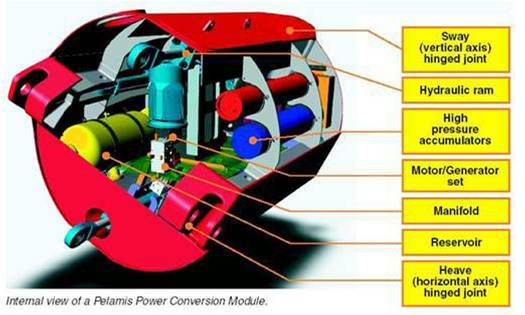 The hydraulic motors drive electrical generators to produce electricity. Power from all the joints is fed down a single cable to a junction on the sea bed. Several devices can be connected together and linked to shore through a single seabed cable.